Hi hi! We are introducing a new series on the blog for Fridays and I am SO EXCITED! I’m not going to lie some week I am really living for Friday. I work a full time job in downtown L.A., have a two hour commute there and back and did I mention I also run this blog full time! Holy cow. Come Friday afternoon I’m a little nutty. This is usually my most favorite few hours of the week. I couldn’t be more happy to be home and in my lounge pants. I chill out, hang with Rascal and usually share a bottle of rosé with Jared. I am naturally a work a holic but I pretty much force myself to settle down and be ‘normal’ for a few hours. So I thought I would share a ‘At Home Happy Hour’ series on Fridays for the summer! These recipes will be super simple, require minimal effort and are paired with a summer wine / beer / cocktail etc. My hope is that you find inspiration to relax for a few hours and save a few bucks (or $100) at those happy hours that can go a little crazy! Grab a few friends or your man and have a killer bite to eat and get a little silly. After all, you deserve it! 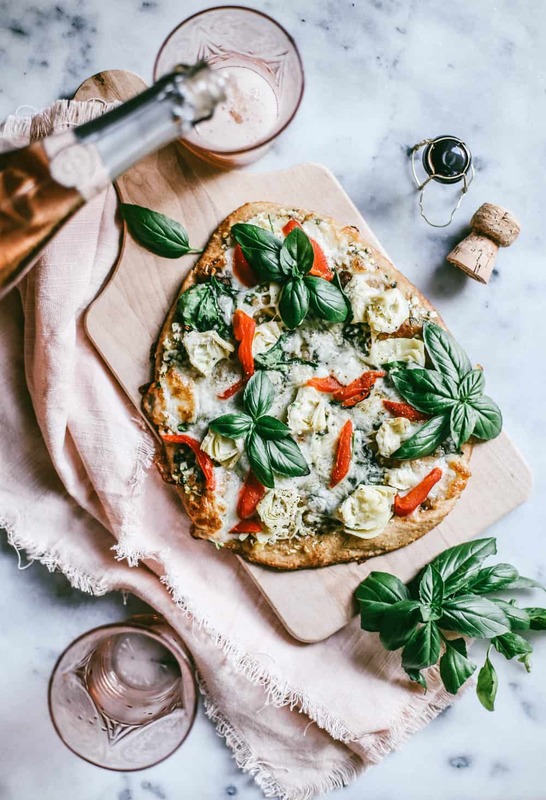 Our first pairing is a spinach and artichoke naan pizza and sparkling rosé! One of my favorite happy hour appetizers is ALWAYS spinach and artichoke dip! We took the classic and played it up pizza style. This app took less than five minutes to throw together! Yes, you heard me right! And is 100% lighter than the dip that you get in most restaurants. We lightened it up with an herbed olive oil base instead of a cream sauce! To kick of the series I couldn’t not choose rosé. Also, don’t kill me if I use rosé twice for one of these little pairings. It’s so hard not to pair it with summer dishes, am I right?! This appetizer is relatively light and happy with herbal notes and salty cheese. I chose a sparkling rosé but any dry white wine would also work very nicely if rosé isn’t your fav! 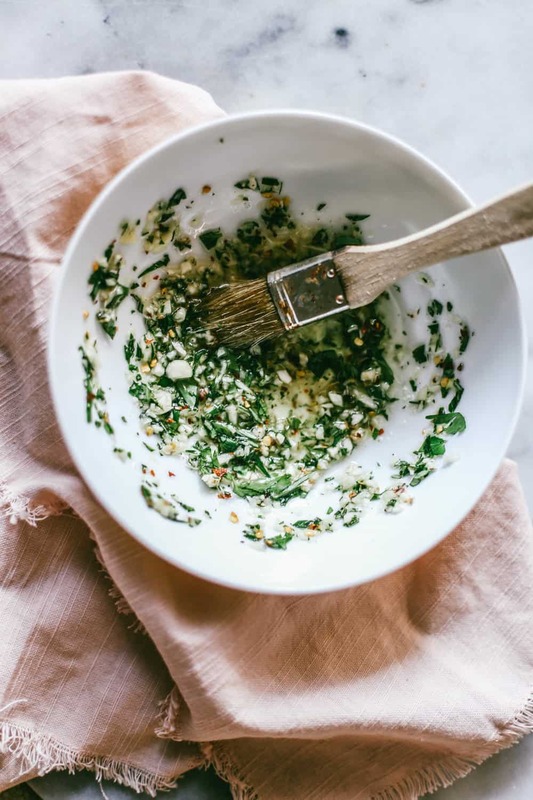 In a small bowl combine rosemary, oregano, parsley, garlic, red pepper flakes and olive oil. Brush naan bread with oil mixture evenly. 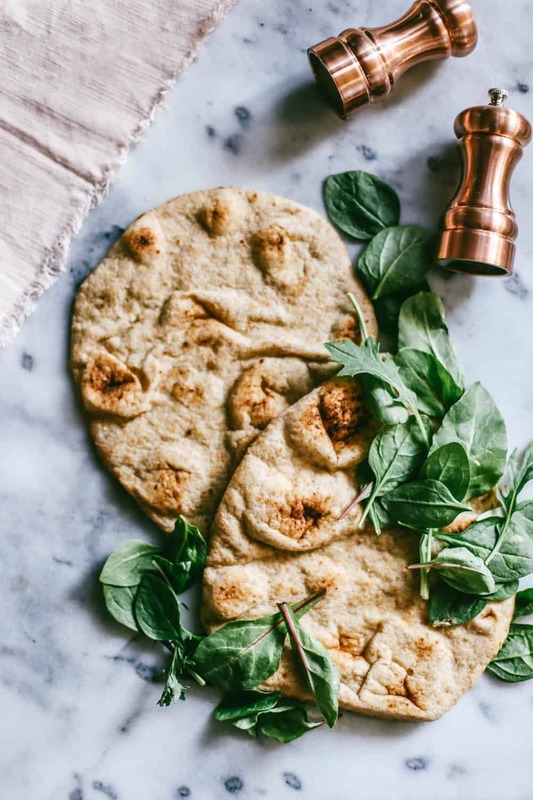 Top naan with artichoke quarters, spinach leaves, cheeses and red pepper slices evenly. 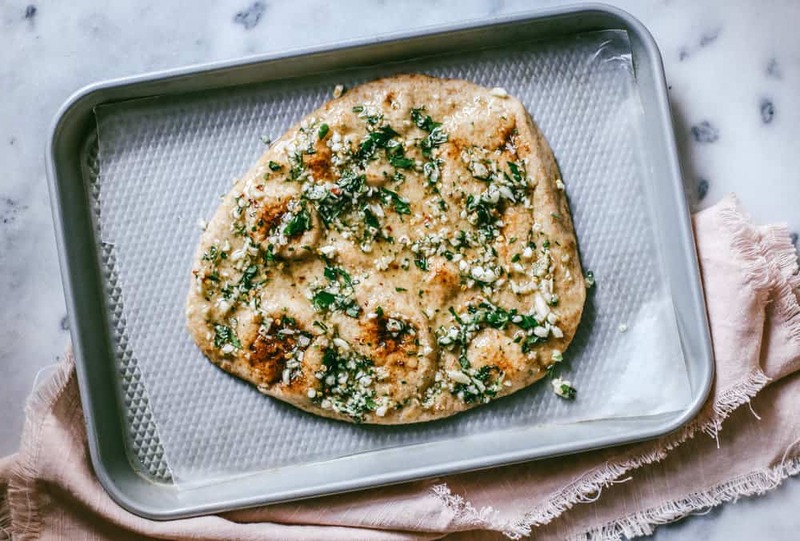 Bake in the oven on a baking sheet for 10-15 minutes or until cheese is melty and slightly brown. 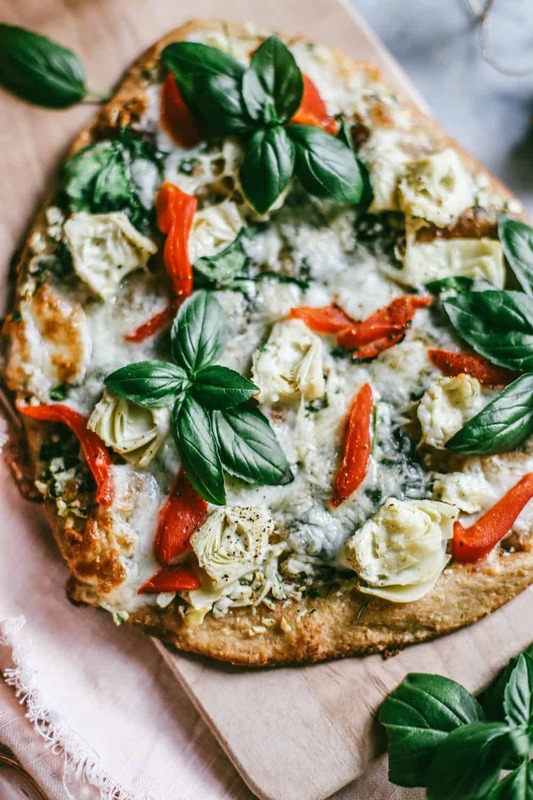 Top with fresh basil leaves. Pairs great with: sparkling rosé! Previous Post DIY Party Margarita Bar! 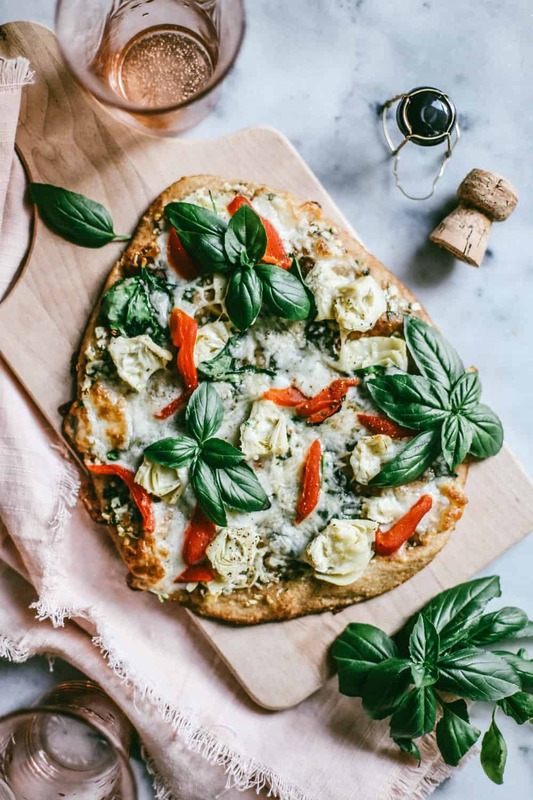 This looks lovely but I have to ask, where is the spinach in this spinach and artichoke pizza? Can’t find it in the recipe :)? Hi Marie! Yikes! Thank you so much for catching this. Should be all fixed now!